We get it: Maintaining clean makeup brushes is one of those habits that's easy to let slip. It's a duty you know you probably should do, even though you'll probably put it off until the next day (and the next day, and the next). Before you know it, replacing your makeup brushes seems like an easier task than scrubbing them down. There are plenty of reasons, however, to maintain the cleanliness of your brushes. Dirty tools can compromise skin health, ultimately doing more harm than good. Diligent cleaning can also lengthen the use of your tools. To keep your skin in top shape, it's essential to know how to clean your makeup brushes thoroughly. Luckily for you, we've put together a simple, straightforward guide to keeping your makeup brushes clean using only environmentally friendly materials. 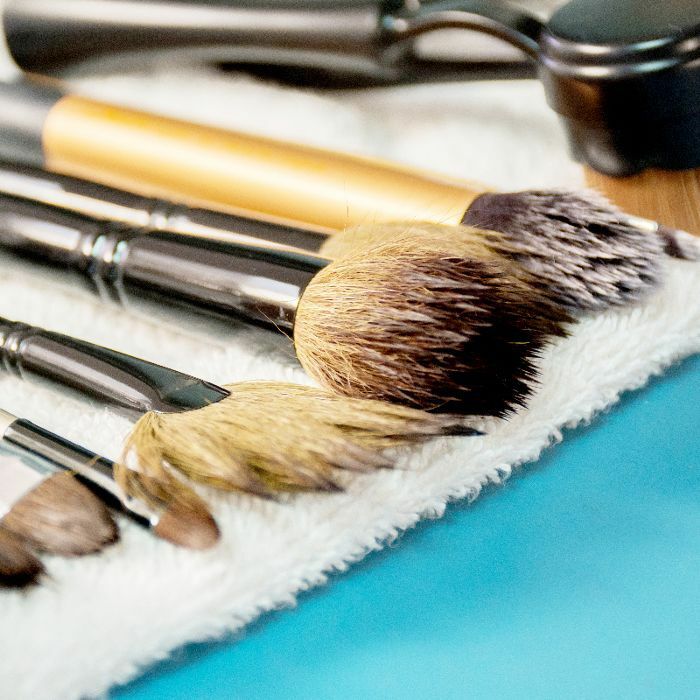 Read on to learn how to clean makeup brushes in five simple steps. Use lukewarm water to wet the bristles one brush at a time, rather than soaking all your brushes at once. This method is effective at dislodging dirt while helping to extend the life of your brushes. Avoid getting water on the brush's base and handle, as this can soften and erode the glue attaching the bristles to the handle. If not properly cleaned, the bristles may detach from the base and cause unwanted shedding. Only a dab of gentle soap is required—the gentler, the better. Harsh ingredients in chemical-heavy soaps can make bristles tough and dry, so opt for an all-natural makeup brush cleaner. Apply a bit of the soap or shampoo directly to your fingertips, and massage the brush head in your palm, focusing on the tips of the bristles. Then rinse the bristles again, making sure not to wet the base of the brush head. Immediately after cleaning, remove excess moisture with a clean, dry towel. Next, reshape the brush. This can be done with your fingertips—just be gentle, and make sure all soap residue is thoroughly cleaned. An important part of cleaning makeup brushes is to ensure they dry properly. Always allow your brushes to air-dry by placing the handles on a counter and the brush heads hanging off the edge. This method allows the brushes to dry in their proper shape while preventing mildew and bacteria from building up. When it comes to cleaning makeup brushes, there's little danger in over-cleaning. However, with a busy schedule, it can be useful to have a game plan in place. Concealer, bronzer, and powder brushes should be washed once a week. Brushes used for the eye area, such as eye shadow and liner brushes, should be cleaned at least once every two weeks. All other brushes can be cleaned about once a month. When in doubt, the best plan is to simply clean all your makeup brushes at once on a weekly basis. Up next, see the seven most important skincare habits to establish in your thirties.